Be vibrant—Form a Plant Based Diet, including JUICE! Posted on March 25, 2014 by diamondsonyourinside	and currently has 1 Comment on Be vibrant—Form a Plant Based Diet, including JUICE! 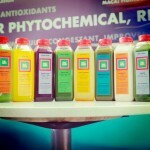 GEM girls believe juicing is an incredible tool in an arsenal to “reboot” a sick body and mind. It is a significant component to an overall plant-based, whole foods diet—which is the key to vibrant health. It is powerful stuff! This is something I learned firsthand. I discovered what juicing and alkalinity does to a compromised system when I went through a year-long battle with cancer and chemo. This experience was more than just inspiring and medically apparent for me, it completely changed my life! But WHY is juicing and a plant based diet such an effective means of changing one’s health—whether the goal is vitality, weight loss or even disease reversal? Two words: Micronutrients (OK, one, but it sounds more dramatic that way). Cells in the body require micronutrients (i.e. vitamins and minerals) to function optimally. When cells receive adequate micronutrients, you feel energized and full. These are nutrient-dense foods. On the other hand, many foods simply provide nutritionally worthless calories and are devoid of the essential nutrients our cells crave. These are calorie-dense, nutrition-poor foods that weaken your body, i.e. things that come in a box. a nugget, or a drive-thru. Diets high in fiber are associated with lower risks of heart disease, colon cancer, diabetes and obesity. It keeps everything moving. LIterally. There is fiber in broccoli, beans, apples, among other vegetables and fruits. HOWEVER, none will be found in the nutritionally void world of white bread, chips, burgers and most other processed foods. Many chemicals (these are good chemicals) found in plants help resist the damage that occurs to the human body from oxygen and the process of metabolism. Chlorophyll, the green energy found in plants, is liquid sunshine that detoxifies and energizes. It’s anti-aging at its best. Surely the fountain of youth is made of chlorophyll! Oxidation leads to cardiovascular disease, diabetes, compromise brain cells. Our dear friends in the plant world contain TONS of natural antioxidants. These essential fatty acids are used for the internal workings and repair of cells throughout the body. These are GOOD FATS. They enhance and nourish brain function and help our systems run smoothly. Flaxseeds, chia seeds, hemp seeds, algae are rich in this nutrient class. AND…ALL FATS ARE NOT CREATED EQUAL! Greens are highly alkalizing to our systems—which is what we want. Disease thrives in acidic environments. CANCER LOVES ACIDITY. All processed food, dairy and animal products are acidic in our system. Greens are great for improving circulation, lifting the spirit, purifying the blood and strengthening the immune system. So …. how does this get us back to The GEM and juicing? It is recommended that we consume five or more servings of vegetables and fruits daily, though many authorities set the bar much higher, being optimal at 10 servings a day. We believe that 80% of what you consume should be plant-based! In order to consistently ingest this large amount of plant-based material, you need to do some planning. REMEMBER: If you keep good food in your fridge, you will eat good food! Some ideas to get your greens: prepare large vibrantly colored salads (our KALE salad rocks), add greens in protein-rich soups such as our lentil soup, and blend smoothies with berries, hemp seeds and greens for a power breakfast or a snack. You’ll never taste the spinach! Keep hummus and veggies nearby to snack on in a pinch. 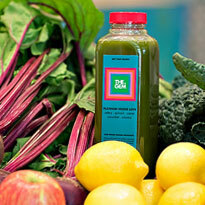 Bottled green juice is an awesome option to start your day. Juicing is just one more tool you can use to build a plant-based nutrition program rich in phytochemicals, and it can make it easier to reach your goal of 10 servings a day of vegetables. 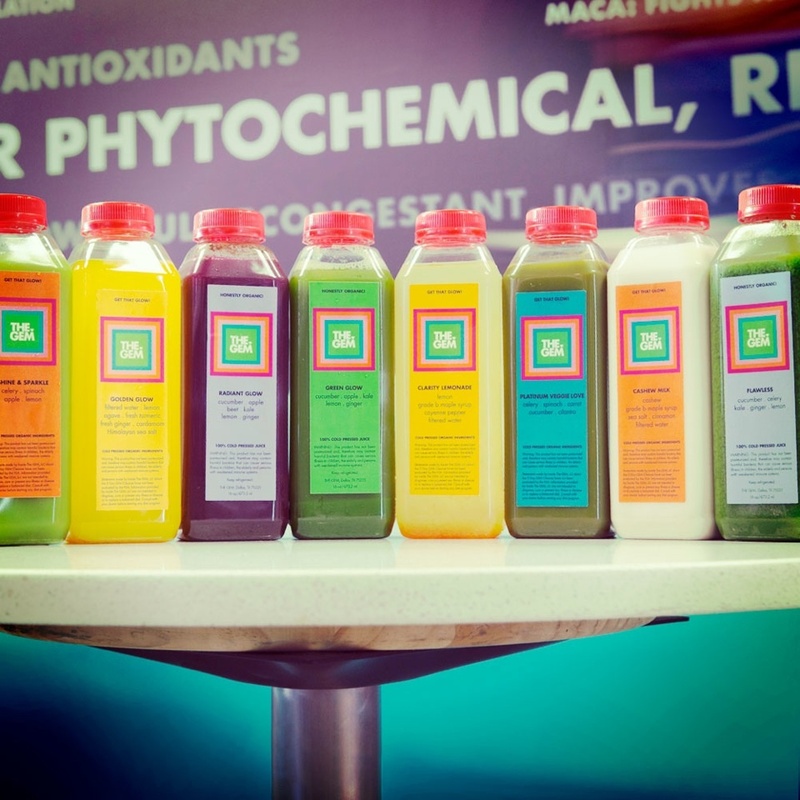 By juicing daily, you provide your body with a high dose of naturally-derived nutrients that boosts your health, support your body’s natural cleansing processes and helps keep you protected against toxins and disease. is easy to digest and the nutrients are easily assimilated. is an incredible energy booster, full of chlorophyll, aka liquid sunshine—the real Red Bull. is full of live enzymes, vitamins, and minerals. can curb appetite, and maintain blood sugar levels. makes you happier. Goodness in … goodness out. Whenever possible, focus on organic foods. Organic really does matter. Juicing and a plant-based diet will bring you an authentic health and mood boost. I promise! This entry was posted in Detox, Food Secrets, Happiness, Health, Healthy Eating Tips, Juicing, Organic and tagged alkalinity, antioxidants, clean living, Detox, food secrets, green juice, Happiness, Health, healthy diet, healthy eating, healthy living, juicing, micronutrients, organic, organic food, phytonutrients, plant-based diet, whole foods diet on March 25, 2014 by diamondsonyourinside.